For 35 years, a French coastal community has been haunted by the ghost of the world’s most iconic novelty telephone. 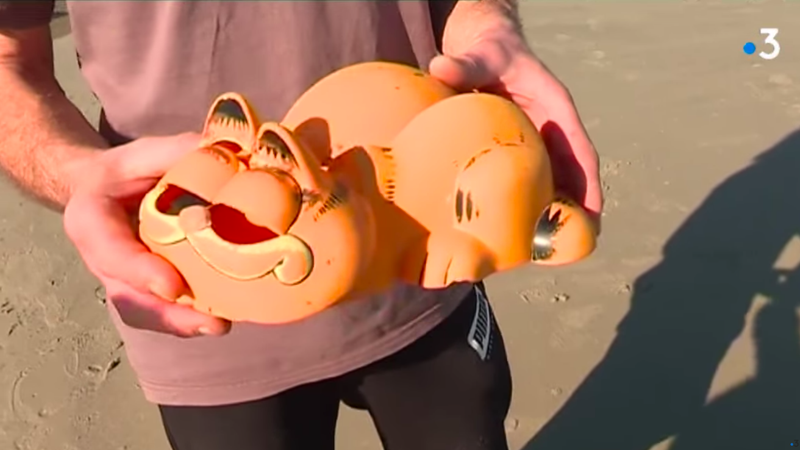 Since the 1980s, pieces of Garfield phones have continually washed ashore in Brittany, puzzling locals and irking environmentalists. Last year alone, 200 pieces were reportedly found, a plague of orange shards covering the beach with the embodiment of our collective Monday-morning ennui. Decades ago, the phone was wildly popular, much like its cartoon inspiration. Adding a shot of sardonic silliness to any room it occupied, these Garfield phones waited in slumber, only opening their eyes when answered and falling asleep as soon as calls ended. Collectors still seek out the vintage phones, but residents of Iroise coast have little difficulty finding them—or, at least, their pumpkin-hued shrapnel. Sea-worn scraps of the weary feline have become so ubiquitous on the beaches of the Finistère region that the Ar Vilantsou anti-litter group recently began using the phone as an emblem of beach pollution in the region, according to France Info. That campaign and the ensuing media coverage reportedly got the attention of a local farmer who knew the source of the phones all along. René Morvan told France Info he was 19 or 20 when a big storm took place in the early 1980s. After the tempest, he and his brothers were exploring caves that could only be accessed during low tide, and found a large container filled with the phones. Morvan hasn’t returned to the cave in about 30 years, but he escorted a team of journalists and Ar Vilantsou representatives to the spot. The team found parts of a shipping container buried in the crag, and orange phone fragments scattered around the cave and stuck between stones. Why are severed human feet washing up on the beaches of the Pacific northwest?